Discussion in 'Scenery, Props, and Rigging' started by Narpthleg, Feb 9, 2019. Hi there! I'm designing a set where I'd like certain walls to pivot and I could use some advise. The idea is to have four walls making a cross, with the downstage 2 turning about 180 degrees each, and the upstage two stationary and braced/bolted into the stage behind. My thought of how to do this was to double-hinge them and imbed a castor inside the far corner of the wall, so that performers can push it and it will pivot. I've attached an image and close up of the hinge action. The two walls in black at the top of the image are stationary, the lower two are the mobile ones. 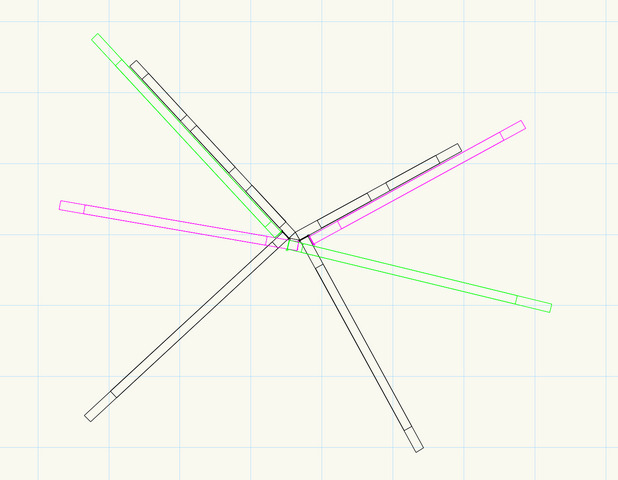 The green wall outlines are most extreme pivot positions of the lower left wall, and the pink lines are the same for the lower right wall. I think this all works on paper, however the walls are to be 2.8m H x 2.4-2.8m W, and I'm imagining about 125-200mm thick, and I'm worried it may not be possible to get hinges large or strong enough to work with that size and weight. What do you think? Does this method make sense, or will it be too unstable? Or is there another, much better way to do this (bonus if it's one where the turning mechanism is not as obvious as a double hinge!)? @Narpthleg Google Soss hinges but I suspect you're not going to like the prices. Are you in London, Ontario, Canada or London, England? If London, Ontario; the nearby Stratford Shakespearean Festival's main venue may still have some fairly butch Soss hinges in use. Whats to prevent you from taking two sets of normal heavy duty hinges and welding them together like a large unsprung saloon door hinge? Jig it up so everything is square while you weld and I would think you'd be off to the races for a pretty reasonable price. Butch!, Crisp image and RonHebbard like this. Let's look at this differently. Consider a top hinge plate on the walls maybe 200mm square on each, the fixed and the pivot wall. Put a flat head screw sticking up (like where you drew the circle on your picture for the pivot point. ) 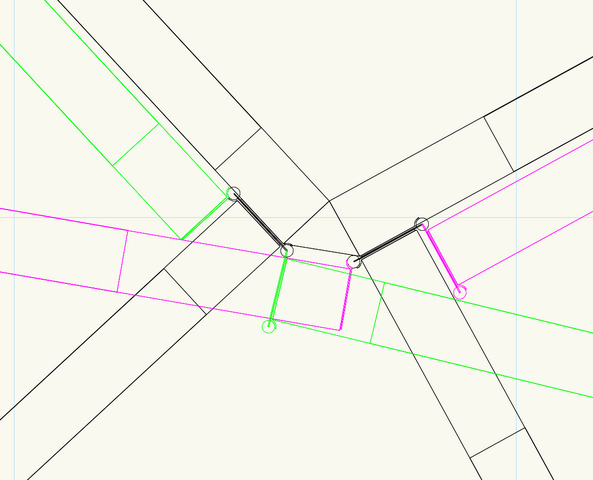 Now connect the two pivot points with flat bar stock. washers and lock nuts. Same setup on bottom of wall. I have no idea as to the pro and con of this idea other than you can allow for wider hing points. Kinda like a top hinge pivots but double. Either I'm not getting it, or is there an oops in your drawing? On the green wall it looks like there are two hinge points, but on the pink ones it looks like there are three pivot points. I think the two pivot points would work, but the three wouldn't as there isn't anything to keep the middle hinge at 90* and it will want to get pulled to 180* making a straight line between the two outside hinges. I like @porkchop 's idea of welding two hinges together. You could just tape some together and mock it up in cardboard to check it. Narpthleg and RonHebbard like this. Whats to prevent you from taking two sets of normal heavy duty hinges and welding them together like a large unsprung saloon door hinge? Those hinges are sprung for a reason. Without the springs to "synchronize" the hinges, the door just flops around. Op, this is way too complicated for the movement you're trying to produce. Why not just put the doors on pivots, top and bottom? Aaron is right: double-barrel hinges rely on the spring tension, or the door just sags to the ground. I think you could get close to this geometry with a hinge with the barrel offset off the end of the flat, by about the thickness of the flat. I'm in London, England. Thanks for the link! Those look great - definitely pricey but depending on how other show costs work out we might be able to afford them. Thanks! Hmm yeah this could work - would be good to have wider hinge points and based on what people are saying, possibly more stable than sprung double hinges. Oops, yeah, you're right, I think I've messed up the pivot points. Having trouble wrapping my head around it in 2D! I need to do as Porkchop said and do a mockup in cardboard to understand better. I see. This makes sense - I worked with a company who welded together standard hinges to make non-sprung double hinges for double-folding doors and it's true they just flopped around and there was too much weight on the castors. I never fully understood exactly what was going on, but now I see what must have been happening. Sounds like pivots are the way to go.